Cultural and physical geography of North America, biogeography, economic geography, cartography and mapping, geographic information systems. 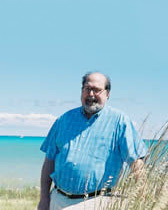 John C. Hudson, who joined the Northwestern University faculty in 1971, has been a member of the Anthropology Department since 1987, when geography activities were moved to anthropology. From 1975 to 1982, he was editor of the Annals of the Association of American Geographers. Among his books are Plains Country Towns (University of Minnesota Press, 1985) which won the first J. B. Jackson Prize awarded by the Association of American Geographers; Making the Corn Belt (Indiana University Press, 1994); Across This Land: A Regional Geography of the United States and Canada (Johns Hopkins, 2002); and Chicago: A Geography of the City and Its Region (University of Chicago Press, 2006). He was a Guggenheim fellow in 1988-89. He has published articles on mathematical geography, historical migration patterns, and the settlement history of the Great Plains. 2002 Across This Land: A Regional Geography of the United States and Canada. Johns Hopkins University Press. 2006 Chicago: A Geography of the city and its region. Forthcoming, Center for American Places and the University of Chicago Press.